A recent study, affiliated with UNIST has engineered a self-sustaining sensor platform to continuously monitor the surrounding environment without having an external power source. This research has been led by the team of Professor Jaehyouk Choi of Electrical and Computer Engineering at UNIST in collaboration with Professor Wonjoon Choi of Mechanical Engineering at Korea University. The findings, published in the March issue of the prestigious journal, Nano Energy note that the proposed platform is expected to contribute to advanced sensing functions of a self-sustaining system for various targeted-ambient elements. In the study the research team presented a self-sustaining water-motion-sensing (SS-WMS) platform to monitor and display the time-varying dynamics of water-motion, such as frequency and amplitude, using only the energy harvested from the water-motion itself. ▲ Scheme of SS-WMS platform for detecting water motion. The oscillatory pressurization of a water droplet between two electrodes generates electrical energy from the electrification of water by the static charge on the surfaces of the dielectric layers. Simultaneously, the variation of oscillating electrical energy generated provides information on the frequency and amplitude of the water motion. 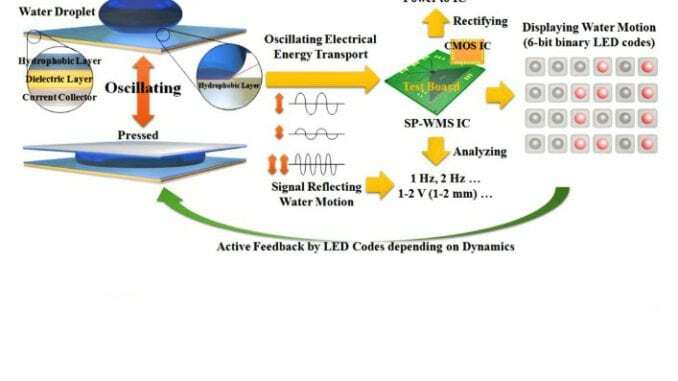 The accumulated energy and the analyzed information are used to control the array of LEDs based on a 6-bit binary code that indicates the dynamics of a water droplet as a self-sustaining sensing platform for water motion. A self-sustaining sensor platform is a core component for Internet-of-Things (IoTs) and smart-grid systems. The existing sensor platforms require energy to operate and display the detected information. Therefore, monitoring, processing, and displaying the minute changes of a targeted-environmental element in a real-time fashion without the use of external power sources or energy storages, like batteries has been challenging. The research team solved this problem with the use of energy harvesting, an essential technology for permanent sensor platforms. Energy harvesting, also known as energy scavenging, is a technology for the harvesting of energy from various sources in the ambient environment, such as wind, water, light, heat, and mechanical energy for conversion into convenient use electric energy. 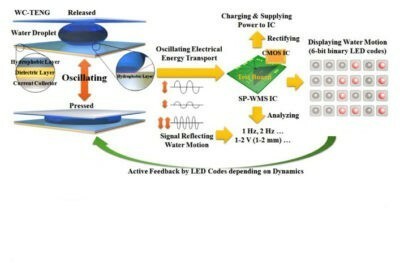 The proposed sensor platform consists of a water-contact-based triboelectric nanogenerator (WC-TENG), a self-sustaining water-motion sensor integrated circuit (SS-WMS IC) on a test printed circuit board (PCB), and a LED array for displaying the detected frequencies and amplitudes of water motion. ▲ A self-sustaining water-motion-sensing (SS-WMS) platform to monitor and display the time-varying dynamics of water-motion. The circuits that store the harvested electrical energy and simultaneously analyze the signals are made using CMOS (Complementary Metal-Oxide Semiconductor) process. CMOS is an economically feasible method used in the production of semiconductors, as well as analog and digital circuits. It is composed of P-type and N-type transistors and can be designed as circuits that process various signals. Moreover, due to the low cost of manufacturing, it is also advantageous for commercialization. In this study, Professor Choi’s team designed the SS-WMS IC based on standard 65-nm CMOS technology, so that one CMOS semiconductor chip about the size of a grand of sand to perform multiple functions simultaneously. Architecture of SS-WMS IC chip and operating conditions, interacting with WC-TENG in response to water motion. According to the research team, their newly-developed SS-WMS platform has overcome the intrinsic limitations of prior self-sustaining sensors by improving the reliability and the continuity of real-time operation and delivering more useful and sophisticated information of the targeted ambient elements. Moreover, because the integrated one-platform concept requires no external power source and significantly reduces energy storage requirements, it can be applied to wireless or no-power sensor platform and grid-scale renewable energy plants, the research team notes. 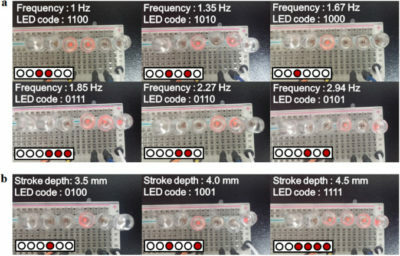 LEDs of SS-WMS platform for water motion detection in the variation of frequency and amplitude. This work has been supported by the Basic Science Research Programs through the National Research Foundation of Korea (NRF), funded by the Ministry of Education and the Ministry of Science, ICT & Future Planning. 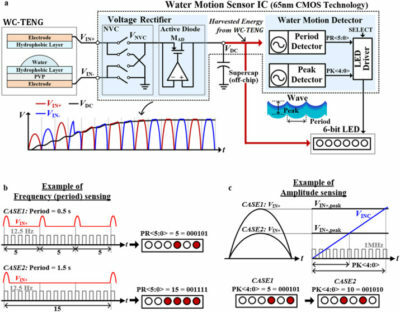 Dongjoon Shin,Taeho Seong, Jaehyouk Choi, and Wonjoon Choia, “Self-sustaining water-motion sensor platform for continuous monitoring of frequency and amplitude dynamics,” Nano Energy, (2017).